I decided to make a mincemeat pie for my dad for Father’s Day. He mentioned a little while back that he would like to have a mincemeat pie, something he hadn’t had in years. I said I’d never had one, ever, as far as I knew, and I forgot all about it. Then, a week or two ago, I ordered a copy of The Farm, chef Ian Knauer’s cookbook and celebration of his family’s centuries-old farm in Pennsylvania. I forget exactly why I decided I wanted it, except that I had seen his cooking show on PBS once and enjoyed it. The family farm he writes about (and gardens on) is a beautiful place. There’s a gigantic hydrangea with white blossoms that look good enough to eat, and a small pond and a meandering driveway and a family cemetery where the founding Knauer, Johann Christopher, is buried. He died in 1769, so obviously the white, two-story stucco farmhouse is not the original family home. Ian and his family in general seem to use the place as a getaway. It’s not clear who owns it, but Ian and his sisters have planted a large garden there, and he goes down for weekends and cooks for family and friends. I was reading through the book and marking the recipes I wanted to try, when I came across a recipe for mincemeat pie. And that’s when I remembered my dad’s wish for one. You would think that I would be beyond the homemade Father’s Day gift, but evidently I am not. I am also aware that this is not the season for mincemeat pie. So what? Now that homes are air-conditioned, cooking things for hours on the stove is not that bad. The pie appeared to be quite a project. 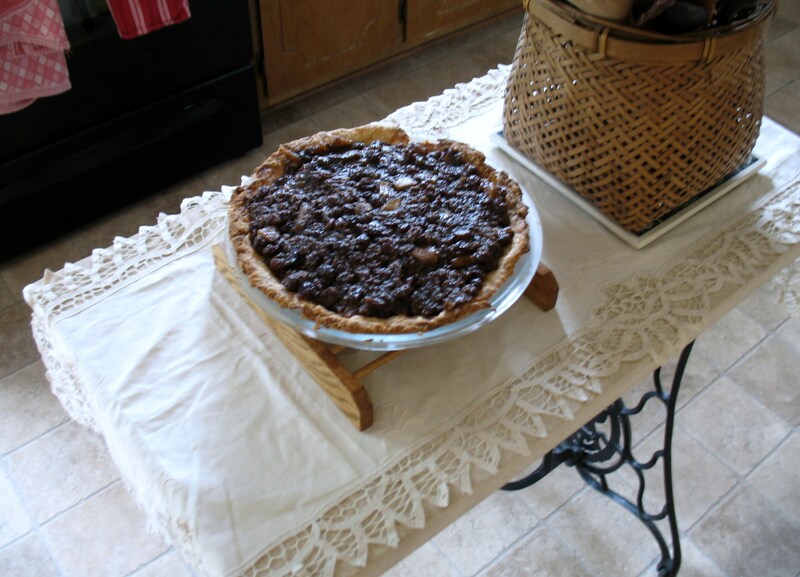 Ian’s version had a mile-long list of ingredients and it made enough filling for four pies. He only had a recipe for making one bottom crust, though, so once you filled it you were encouraged to freeze the additional three quarts of filling until time to make another pie. I decided to cut the recipe in half. I made my grocery list, and added the ingredients that I didn’t already have: suet, pineapple juice, apple cider, raisins and currants, ground beef, molasses, and apple cider vinegar. There. Friday night, and my list was in order. I woke up on Saturday morning in a mild panic. Ian’s farm was in Pennsylvania, not North Carolina. I didn’t know where to find currants in the store—would they be in produce, or with the dried fruits? Did I have to use beef suet? What if this pie was not at all like the one my dad remembers? Shouldn’t it have a top crust? I went to the Internet and looked up more recipes for mincemeat pie. Martha Stewart had one, but it was meanly hidden behind some sort of subscription requirement and you could only read bits of the recipe around the “Become a member now!” box, which floated as I tried to peek beneath it. But I saw everything I needed to see. One of the first instructions in the recipe was to “take down two jars of mincemeat filling from the shelf.” Really, Martha? Alton Brown, I believe—after a while it’s difficult to say where I read what—offered the advice that butter could substitute for suet. Thank you. Then I pulled down my grandma’s old cookbooks, thinking one of them might contain the recipe that she used for her pie. Her cookbooks are always fun to read through. She used to cut recipes out of the newspaper and tape them inside in open spaces and on the end pages and sometimes on pages with other recipes, like Martha’s floating subscription box. I bet she did that to cover up recipes she hated. I would. THIS BOOK includes the finest plastic ring binders available, BUT, like most plastics, the BINDERS CAN BE DAMAGED BY EXCESSIVE HEAT, so AVOID exposing them to the direct rays of the SUN, or excessive heat such as IN A CAR on a hot day, or on the top of the kitchen STOVE. If not exposed to heat, the binders will last indefinitely. I don’t know why they didn’t put indefinitely in all caps, but maybe by the end of that passage there wasn’t enough oxygen left. Since I didn’t find a recipe called “The Mincemeat Pie Your Father Fondly Remembers,” I went to the store with my list and bought what I needed to make half a recipe of Ian Knauer’s version. As I collected my ingredients and sent up a desperate prayer that I would find a good substitute for currants, the song “You Can Do Magic” came on over the Food Lion sound system. Excellent. I can do magic. I can make mincemeat pie. I can make it without currants. And that’s what I did. It was hard to get started, because I was nervous, but I browned the beef in a little bit of butter, then removed it with a slotted spoon to a large, heavy pot. I put a pound and a half of raisins in the pot with enough dried cherries and cranberries to take up the space that currants would have occupied. I peeled and chopped apples, grated orange and lemon zest, decanted varying amounts of fruit juice, cider, cider vinegar, honey, and molasses; I added a half stick of butter. I sprinkled in salt and spices: cinnamon, nutmeg, cloves, allspice, and ginger. With the heat turned up to bring it all to a boil, I took a large wooden spoon and began turning the mixture over. That’s when the magic happened. Oh, the smell. It was like apple pie and Christmas. It was rich and spicy and dark and wonderful with the citrus zest sending up bright sparks. It simmered for about an hour, getting progressively thicker. I tasted it, and began to think that maybe I had eaten some of my grandmother’s mincemeat pie. An angel sang, softly, and not for very long. I do hope that my pie comes close to Grandma’s. Because the whole point of making a mincemeat pie in June was to recreate a feeling and maybe provide at least a quick flashback to a yellow kitchen in a white house on a small farm in eastern North Carolina. Unlike Ian’s family, we can’t still visit that farm, and I’m seven miles removed from my parents’ farm, which also overlooks a pond. But Redbud farmlet is chugging along. Our chickens are now 12 weeks old and healthy, the goats are staying inside the corral and haven’t lost their collars, and the kale and squash are growing. When I step under the shelter where the tractor lives, the soft dirt underfoot and the shade and the smell of the old tractor make me feel like I’m back in my grandfather’s barn. In a way, the original Winslow family farm is still thriving—it’s just scattered around the state a little more than it once was. I delivered the pie this morning right after going to church with my parents, where my dad won a gift certificate for being the father with the oldest child present. I bet I was also the oldest child who had made her father an ugly homemade gift. Best part: I can give him another one in December, because the frozen mincemeat keeps for six months. Boom. Want a little homemade ice cream with your mincemeat pie on Father’s Day? Read this! It has been a longish time since I produced a tract. The original piece, which explains the reason for the series, is here. Today’s tract is for those of us who have perhaps waited a bit late in the day to rustle up a Christmas gift or two and are feeling a tad desperate, but it is also aimed at those smug persons who have completed their Christmas shopping and are sitting back with upper lip curled at everyone who has not. Because shopping has very little beauty in it, whereas a homemade gift is always merry and bright. 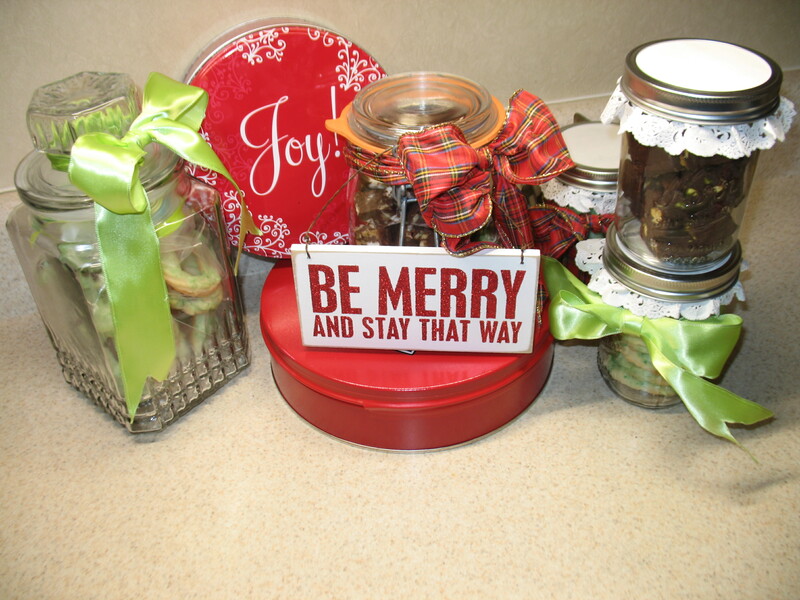 Chances are, if you are participating in the holidays to any extent, you have already made cookies for the office, or the traditional family fruitcake. The treats that you make each year would be a perfect gift for someone, assuming that you know that person’s food allergies and tolerations. If you don’t have your own recipe to share, here is a simple recipe for homemade fudge. The list of ingredients is short, the amount of time required is minimal, but the result is a wonderfully heavy tin of delicious chocolate. Combine the chocolate chips and the sweetened condensed milk in a microwave-safe bowl and heat for about 1 minute. Stir, and if it is still not smooth give it another 30 seconds and stir harder this time, like you really mean it. If you had stirred vigorously after the first minute you would have been fine. Stir in the vanilla and nuts and glop it into a wax paper- or parchment-lined 13 X 9 pan (or a 9 X 9 pan, for slightly taller fudge). Leave the ends of the paper hanging over two of the sides to use as handles when lifting the fudge out later. I also like to put a piece of parchment or waxed paper on top and press it down to smooth it out before placing the pan in the refrigerator to chill. Once it’s firm, use those nifty handles to lift out the block of fudge, peel off the top paper if you used it, and cut the fudge into reasonable portions and package as desired. To make Rocky Road Fudge, follow the recipe above, using walnuts and adding three cups of mini marshmallows. I also made a batch using dark chocolate chips with chopped dried cranberries (about half a cup) and 1 cup of pistachios. I made some of that last night, and it is good and rich in antioxidants. I did say that the amount of time to make the fudge is minimal, but be warned that the clean-up is sticky. You will certainly have to wash the can opener. Why doesn’t condensed milk come in a pop-top can? If you are unwilling to add to the caloric load of the season with a gift of food, then I have another idea for a homemade gift: Write a letter to your gift recipient. The power of written communication is mighty. If you need a recipe for your letter, here is a simple one addressed to Joe. Please change “Joe” to the name of your recipient. Paragraph 1: Wish Joe a happy holiday season. Paragraph 2: Tell Joe that you are grateful to know him, and give at least one reason why. Paragraph 4: Express your desire to experience more happy times with Joe in the new year. It isn’t difficult, and it is a great deal less sticky than making fudge or even cookies. Don’t worry about perfection in spelling or punctuation, because perfection is not the goal. I made a batch of Rocky Road last night, and realized as I was cutting it this morning that I had forgotten to add the vanilla. But it doesn’t really matter. I sampled it, and it tasted delicious. That’s the magic of Christmas. Our gift offerings, even when they are flawed, are valuable. Photo: While unable to write anything, I did manage to create a nest from yarn (drape glue-soaked yarn over inflated balloon; pop balloon when dry) and decorate a few Easter eggs. I did the two-toed thumbprint biddy, my sister did the caterpillar. This counts as an appropriate illustration because Fabergé made both eggs and icons. So ha. I wanted so much to write an icon. It would be nice to find all of the right words, arrange them concisely and precisely, and wind up with a story that is haunting in its intensity and as tasty as pie. But I can’t seem to do that. I’ve been sitting here at the computer for days and days, completely unable to write anything in spite of having been so inspired by my new pie basket with its mandala lid. A writing project is an adventure, and one of the first and most important tricks to success is to approach it as one. Gear yourself up for it by anticipating how well it is going to go and how much fun it will be. Imagine launching a kayak into a river or floating in an inner tube down a mountain stream. The words, like the water, will flow easily and take you exactly where you want to go. Don’t forget to wear a helmet. The second trick is to maintain perspective. Remind yourself that you are good at what you do. You are intelligent, and capable, and interesting. Once you leap into your writing project, all of those characteristics—and thousands more that are unique to you—will be at your disposal to get you moving. The third trick is to focus your attention. Your project will not be as successful if you are not giving it your full attention. This does not mean straining and forcing your mind to labor over the task; it means thinking about your topic and your purpose and then applying the first two tricks by reminding yourself: This is an adventure I am well-equipped to enjoy. If after gearing up mentally you find that you still face a blank screen or page with an equally blank mind, try this: Recall a time when you were feeling particularly creative. It can be from as far back as kindergarten, when you were happily stringing colorful beads on a piece of yarn. Writing is simply a more complex type of bead-stringing, after all. Banish your fears and concerns about it, and try to regain that spirit of calm absorption you feel while doing something relaxing and enjoyable. Isn’t it wonderful that you can bring back that peaceful feeling right now? And isn’t it much nicer to look at the blank page while feeling that way than it was to slump down and bang your forehead on the desk? Why yes, it certainly is. But lately my writing projects have skipped the toy and amusement stages and gone straight to tyranny. 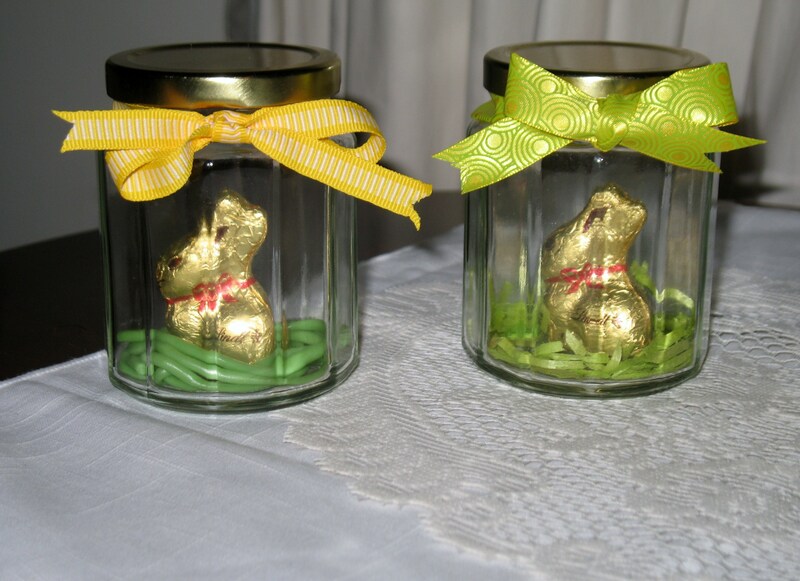 Another thing I did while I wasn’t writing was I put some Lindt chocolate bunnies inside little jars with Wilton candy grass (left) and paper grass (right) as nesting materials. Yeah, I don’t know why I did this, either, except that I saw it in Martha Stewart’s magazine and knew it was something that even I could manage successfully. Before starting work, pray in silence & pardon your enemies. Work with care on every detail of your ikon, as if you were working in front of the Lord Himself. During work, pray in order to strengthen yourself physically and spiritually; avoid above all useless words and keep silence. Do you ever read the reviews of Internet recipes? There is always at least one that says, “Really enjoyed this recipe, which I followed to the letter except that I didn’t have ground beef so I used ham, and then I added a can of black beans to the sauce and substituted crushed pretzels for the sour cream because my family is lactose intolerant.” That’s basically how I treated the Rules for an Icon Painter, so I guess I shouldn’t be surprised that I never did end up with a digestible pie. 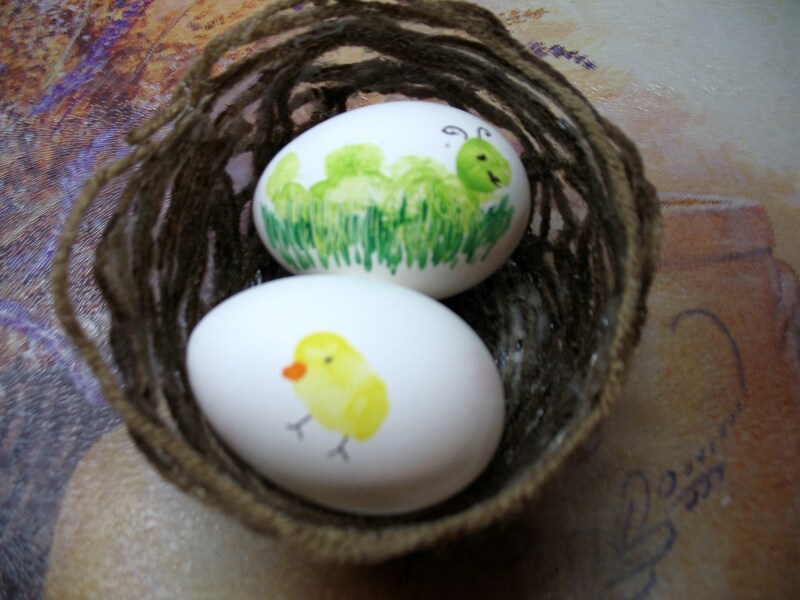 But I have several Easter treats to show for my trouble, and all my enemies have been pardoned. In my younger and more vulnerable years I faced a deadline for a poetry assignment. Poetry didn’t come easily to me, and I was most likely to serve up a Dr. Seussish rhyme or jingle. Even so, I always needed some sort of hook to get started. At the turkey tucked under your arm. And well, anyhow, beat it. Take the bird home and just eat it. If that morsel of leftover poetry left you unsatisfied, here—in plenty of time for Thanksgiving—is an excerpt from Fitzgerald’s “Turkey Remains.” See if you can spot the one I borrowed for my poem! At this post-holiday season the refrigerators of the nation are overstuffed with large masses of turkey, the sight of which is calculated to give an adult an attack of dizziness. It seems, therefore, an appropriate time to give the owners the benefit of my experience as an old gourmet, in using this surplus material. Some of the recipes have been in my family for generations. (This usually occurs when rigor mortis sets in.) They were collected over years, from old cook books, yellowed diaries of the Pilgrim Fathers, mail order catalogues, golfbags and trash cans. Not one but has been tried and proven—there are headstones all over America to testify to the fact. Take one turkey and one pan of water. Heat the latter to the boiling point and then put in the refrigerator. When it has jelled drown the turkey in it. Eat. In preparing this recipe it is best to have a few ham sandwiches around in case things go wrong. Walk quickly from the market and if accosted remark with a laugh that it had just flown into your arms and you hadn’t noticed it. Then drop the turkey with the white of one egg—well, anyhow, beat it. This is the delight of all connoisseurs of the holiday beast, but few understand how really to prepare it. Like a lobster it must be plunged alive into boiling water, until it becomes bright red or purple or something, and then before the color fades, placed quickly in a washing machine and allowed to stew in its own gore as it is whirled around. Only then is it ready for hash. To hash, take a large sharp tool like a nail-file or if none is handy, a bayonet will serve the purpose—and then get at it! Hash it well! Bind the remains with dental floss and serve. This recipe is for a party of four. Obtain a gallon of whiskey, and allow it to age for several hours. Then serve, allowing one quart for each guest. The next day the turkey should be added, little by little, constantly stirring and basting. For Weddings or Funerals. Obtain a gross of small white boxes such as are used for bride’s cake. Cut the turkey into small squares, roast, stuff, kill, boil, bake and allow to skewer. Now we are ready to begin. Fill each box with a quantity of soup stock and pile in a handy place. As the liquid elapses, the prepared turkey is added until the guests arrive. The boxes delicately tied with white ribbons are then placed in the handbags of the ladies, or in the men’s side pockets. I have my own ideas about how to handle Thanksgiving leftovers. I love turkey and dressing sandwiches slathered with French onion dip. And here’s an idea for leftover desserts: Last month I made a hefty batch of pumpkin pie bars. There were far too many to consume as dessert, but I didn’t feel comfortable taking them to the office. They were so… heavy. Then I hit on the idea of crumbling one up and swirling it through my morning oatmeal. Delicious, and filling! I propose that leftover pumpkin or pecan pie, or even an aging coconut cake, could also be treated in this way. A slender slice of pie will add a bit of sweetness and spice to the virtuous feeling you get from eating your oatmeal. Whatever you eat in the coming feast-days, have a happy Thanksgiving—and inter your leftovers with care. Last weekend the Jehovah’s Witnesses returned, reminding me of my plan to create Tracts for the Pleasant Life that I can force on people who come to the house uninvited. Tract #1 was a solid success, and it’s time to continue the series—because you never know when the Witnesses might be mobilized again, and I need to update the tracts as often as they update The Watchtower. There are wooded areas nearly everywhere. Even if you don’t live near the country, look for clusters of trees in parks, bands of trees running like stitches behind and between subdivisions, and tiny groves in your own back yard. If all else fails, and you find yourself fenced off from every stand of trees that you’d like to visit, go to a nursery or garden center and pretend the rows of root-wrapped trees are really a forest on its way to a new location. Woodlands do have a different air and light and sound, especially in fall when the leaves lisp underfoot and the sun, no matter where it really is in the sky, seems tangled in the treetops where it burns yellow, orange, and red. And the scent of the woods in autumn is interesting, like strong brewed tea, tart fruit, and a hint of something like tobacco. I love that line about the “violin-browns of chestnut and oak.” I can practically taste the trees in that passage, and it tastes like I’m munching on walnuts or pecans. Most Pleasant Thing to Do? Chase falling leaves, and save a colorful one that you particularly like. Climb a tree, preferably one with yellow leaves, and pretend you’re sitting in a sunny room. If you don’t care for heights—or if most of the leaves are already under the tree—sit beneath the tree instead. You’ll get the same effect. If there is a creek in the woods, remove any fallen leaves that may be clogging the flow. This is a very satisfying activity, so be warned that you may lose a largish chunk of time while doing it. Those are just the things that I like to do. You may have other ideas. Speaking of pecans and walnuts, it seems fitting that I should continue to include a recipe on my tracts, perhaps as a tear-off card. So here’s my mom’s recipe for Spicy Pecans. They are simple to prepare and mildly addictive. They are also a lovely violin-brown and reminiscent of a violin in shape, too, I think. Best of all, they are a gift from the trees. Toast 2 cups of pecans in a 300° F oven for 25 minutes, stirring occasionally. As the pecans toast, melt ¼ cup (4 tablespoons) of unsalted butter. In a large bowl, mix 1 tablespoon + 1 teaspoon of soy sauce and 1 teaspoon of hot sauce into the melted butter. Stir the pecans in the savory butter until thoroughly coated, then drain them on paper towels. When dry, place the pecans in an airtight container. Or eat them while you walk in the woods. Magic isn’t always pretty; sometimes it’s intentionally creepy. This weekend I carved our Halloween pumpkin—or, to be more precise, Ernesto used a 2″ bit on his cordless drill and drilled seven holes in about 14 seconds. This method meant that a plug was left behind in the pumpkin, which had to be extracted. And because it was difficult to get a good grip on them, and because they were still firmly attached to pumpkin pulp and seeds and sinew in the middle of the fruit, they did not come out willingly. “Go get the corkscrew,” Ernesto said, wiping strings of wet pumpkin drool off his drill. So I did, and when I brought it back outside Ernesto used it to quickly and efficiently remove all the plugs. Once that was done, all I had to do was clean out the holes a bit and then place my rubber rats (three for $1!) in various holes, in various positions. Don’t they look nasty? Magic is nearly always unexpected. For the past several days Ernesto has been looking for a particular book—One Hundred Years of Solitude, by Gabriel Garcia Márquez. We both love that book, and finally last night after several failed attempts to find his Spanish copy amid the ridiculous number of books in our attic, Ernesto asked me to order a Spanish-language copy for the Kindle. I did. “Here it is,” I said, passing him the Kindle. He looked at it, then handed it right back to me. “Read it out loud,” he said. At that time Macondo was a village of twenty adobe houses, built on the bank of a river of clear water that ran along a bed of polished stones, which were white and enormous, like prehistoric eggs. The world was so recent that many things lacked names, and in order to indicate them it was necessary to point. For my final magic trick of the weekend, I made pumpkin pie bars. They have so many ingredients in them that it’s ridiculous—not a long list of ingredients, you understand, but they have an extravagance of certain items: two tubes of chocolate chip cookie dough, seven eggs, two blocks of cream cheese, two cans of pumpkin, and three tablespoons of pumpkin pie spice! Add sugar and a splash of vanilla, assemble everything in a 13 X 9 pan, and you’re pretty much done. The cookie dough forms the bottom crust, and the spiced pumpkin and cream cheese mixtures are added separately and then swirled. Well, it seemed like too much, but I did it anyway only I held back one of the eggs. The finished product weighs about 30 pounds, but good? Holy smoke, they are magically delicious. And we have such a huge number of them that I expect they will last for at least one hundred years. I wish I could magically come to where you are and give you some.